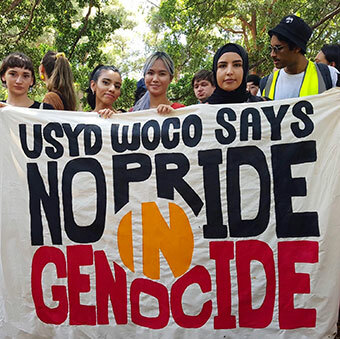 The University of Sydney Wom*n’s Collective (woco) is an intersectional, feminist, activist group who are most active around issues of sexual assault on campus and abortion rights. We have existed for over 50 years on campus and are committed to continually improving the lives of women and non-binary students. We recognise that all oppression is interconnected and stems from a place of exploitation under an unfair capitalist system. We especially recognise the struggles and resistance of Indigenous women and gender diverse people in fighting back against the colonial structures which have been imposed onto them. We must always prioritise Indigenous voices in our activism and advocacy, and especially those of women and queer people. We strive to work with all intersections of persecuted identities in order to create a better world in which equality is achieved. There is no pride for some of us without liberation for all of us. Woco meets regularly for meetings as well as hosting events throughout semester. The main purpose of the Sexual Harassment Officers on campus is to work towards improving the safety of all students by creating initiatives and campaigns that create awareness about threats and acts of sexual and emotional violence, harassment, intimidation and assault. Alarmingly, 87% of Australian wom*n have experienced at least one form of physical or verbal street harassment in 2015, a trend that has seen 9/10 wom*n change their behaviour to ensure their personal safety in the last 12 months. This year, we will be focusing on challenging victim blaming stereotypes that are predominant in discussions around sexual harassment and assault. Our campaigns will draw attention to the way that humour and normalized assumptions are used to perpetuate harmful myths about harassment and assault. We will also focus on “informed consent” as one of our main concerns. In the past, the Sexual Harassment Officers have primarily aligned themselves with the University’s autonomous Wom*n’s Collective, which we will continue to do. On this note, it is important to recognize that sexual harassment and violence does not only happen to those who identify as wom*n. It is a common misconception that only wom*n are affected by sexual harassment and violence, an assumption that leaves many people’s experiences unheard and delegitimised. This year, we will be running autonomous (for female identifying students) as well as non-autonomous (for everyone) workshops and campaigns to challenge normalized and dangerous myths about sexual harassment. If you ever feel unsafe on campus, give campus security a call on 9351 3487.